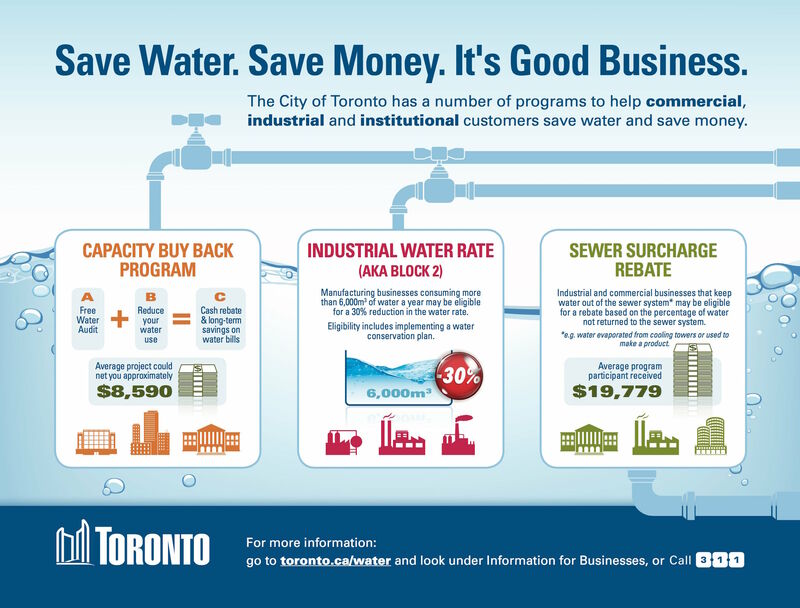 The City of Toronto has a number of conservation initiatives designed to help commercial, industrial and institutional customers save water and save money. Communicating program information to a wide audience required an interesting, informative and visually engaging infographic. TWG creative team used water themed visuals as the basis for the look and feel. Sector specific graphics were developed to identify the target groups and key text was laid in to clearly outline program benefits. Three initiatives; Capacity Buy Back program, The Industrial Water Rate, and Sewer Surcharge Rebate provide various options and alternatives for targeted audiences. The City of Toronto wanted to articulate key program elements through the use of graphics and text, with an emphasis on graphics. The look of the final version needed to be clean and contemporary, easy to understand and simple to communicate. It also needed to be useful for print and electronic media. TWG was cognizant of City of Toronto brand guidelines at all times throughout the design process and utilized brand colours within the design.